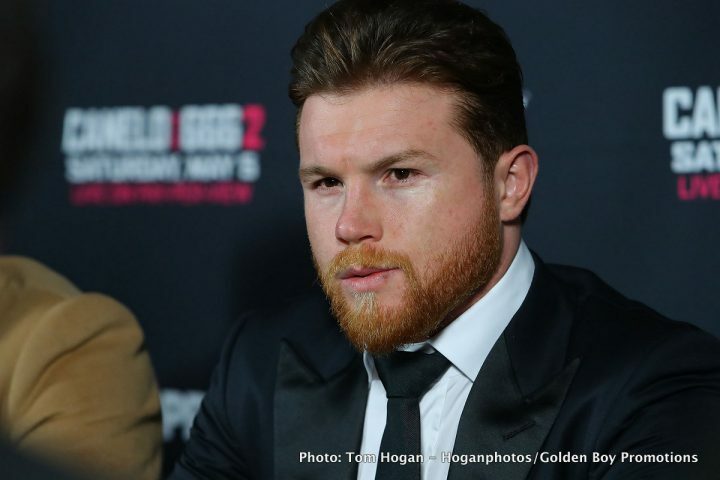 By Sean Jones: Saul Canelo Alvarez announced on Tuesday that he’s signed up for the World Boxing Council’s VADA random year-round drug testing program. This is excellent news for fans that are hoping to see Canelo face middleweight champion Gennady Golovkin in a rematch on September 15, because without the Mexican star signing up for the drug testing, he likely wouldn’t have gotten the fight. Golovkin had it clear that he wanted Canelo to enroll in the VADA testing before he would agree to fight him again. Now that the 27-year-old Canelo has done so, it removes a huge obstacle that was blocking the fight with GGG in September from taking place. ”I want to let you know that I just signed the contract with @Vada_Testing for year round testing,” Canelo said on his social media on Tuesday. This was a situation where was such a tremendous back lash towards Canelo over his failure to enroll in a drug testing program, he had little choice but to finally sign up. Canelo’s promoters Oscar De La Hoya and Eric Gomez of Golden Boy had said that he would enroll in a drug testing program as soon as his next fight was signed. However, the fight that they and Canelo want is against Golovkin, and he wasn’t about to sign for a rematch with the Mexican star unless he was enrolled in a drug testing program with VADA. The fact that Canelo finally made that move is good. It’s just unfortunate that it took him well over 1 month to agree to do it. He should have enrolled last month. Canelo did himself no favors in waiting this long to finally agree to the testing. It must have been difficult for him to have so much pressure on him from the boxing fans. The fact that Canelo lasted this long before eventually agreeing to the testing is remarkable, because I think most fighters would have readily agreed to the testing to clear their name. If Canelo had refused to enroll with VADA, it likely would have cost him a ton of money with the GGG rematch not taking place in September. Instead of making a mountain of money fighting Golovkin, Canelo would have likely had to settle much less in a fight against Golden Boy slugger Gary ‘Spike’ O’Sullivan on September 15. Canelo would have been further ridiculed by fans for choosing a weak opponent instead of one of the talented contenders like Jermall Charlo, Sergiy Derevyanchenko, Demetrius Andrade or Daniel Jacobs. “Canelo just signed contract to year round VADA testing,” Oscar De La Hoya said. It was important that Canelo sign up for drug testing, as he was popped on 2 of VADA’s drug tests on February 17 and February 20 for clenbuterol, a potent performance enhancing drug that is said to improve stamina. The Nevada State Athletic Commission handed down a 6-month suspension to Canelo in their hearing two months later April 18. Before that, they had given Canelo a short suspension while they investigated his case. Canelo said he ate contaminated beef in Mexico. The Nevada Commission’s rules state that a fighter is responsible for what goes into their body. That mean that didn’t matter how the clenbuterol got into Canelo’s system. The fact that it was there in the first place was enough for the Commission to suspend him for 6 months. It appears Canelo folded under the immense pressure that he was under from the boxing world to enroll in a VADA testing program. The WBC president Mauricio Sulaiman announced this week that he had removed Canelo from their rankings for the WBC organization due to his failure to enroll in their ‘Clean drug’ program. Now that Canelo has supposedly signed up for the VADA testing, the WBC will likely reinstate him in their rankings. I’m not sure whether Canelo cares too much about that, as he hasn’t expressed a lot of interest in winning the WBC belt or any of the titles. Canelo’s goal in facing Golovkin is to prove that he can beat the best middleweight in the division. That seems to be Canelo’s main objective in facing Golovkin. The belts are meaningless in comparison to Canelo beating GGG and showing that he’s the best fighter in the 160lb weight division. Canelo’s last test for performance enhancing drugs was said to be on April 3, so he’s essentially been untested for the last 5 weeks. That’s a long time for a fighter not to be tested. That’s a lot of time. Hopefully, Canelo hasn’t eaten anymore contaminated beef during those 5 weeks, because it would look bad if he’s popped for clenbuterol on his first test with VADA. Hopefully there will be updates given on the results of Canelo’s tests and the dates of the tests. The tests need to be done fairly frequently for them to be worth it. You can’t have Canelo tested once every 2 months and expect that to be effective. Canelo’s promoter Oscar De La Hoya calls him the ‘face of boxing.’ When you hold a lofty status like that, it’s important to lead by example, and to show that your drug free and that you’re willing to be tested like other fighters. It would look bad if Canelo were exempt from being tested due to his popularity. Boxing doesn’t work like that. There are a lot of people that look up to Canelo, and he has a lot of weight on his shoulders. He can’t just do what he wants and be stubborn about it. To be the face of boxing, you must be mature and above all you need to act like an adult. Drug testing is one sacrifice that the superstars must deal with. Canelo isn’t obligated to sign up for testing. This is obviously a voluntary thing, but given the weight on his shoulders, he had to. If nothing else, Canelo had to sign up for VADA if he wanted the huge payday fight with Golovkin on September 15. Without Canelo signing for drug testing, he would have made far less money fighting O’Sullivan on that date. It would have been a crazy move on Canelo’s part to stubbornly refuse to enroll in VADA testing and wind up not getting the GGG rematch. Golovkin should be very pleased with the news of Canelo agreeing to be tested. Now his promoter Tom Loeffler needs to sit down with Golden Boy and get the rematch made for September 15, so the two fighters can face each other again.